Posted in Happiness is..., Lily's corner, Products we ❤, Tummy love. We love quinoa (pronounced “keen-wah”). This superfood contains a perfect balance of all 8 essential amino acids, making it a complete protein. It also packs a nutritional punch of dietary fibre and calcium. Plus it’s gluten free and easy to digest! For this salad, first you make your quinoa. I made this salad for a dinner party so I doubled the recipe and used 2 cups. Follow the instructions on the package. 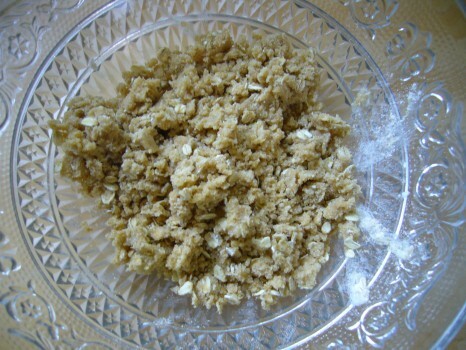 If you have a rice cooker, make your quinoa in it! 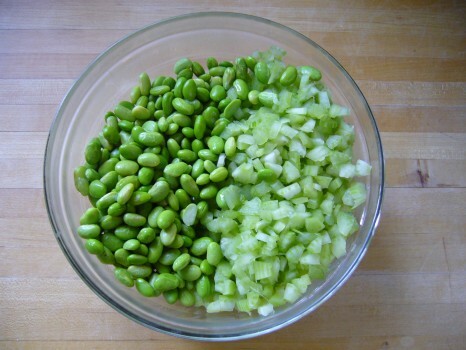 Add edamame (about 2 cups, cooked) and chopped celery (about 2 cups). 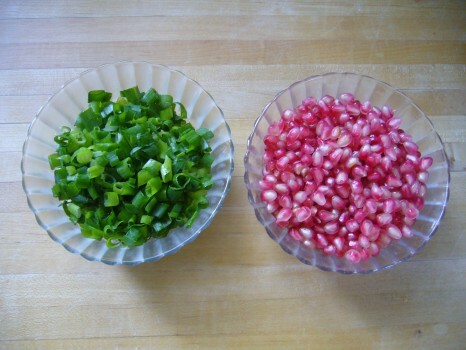 Add 1/2 cup chopped green onion and 1/2 cup pomegranate seeds for a pop of colour and a burst of flavour. 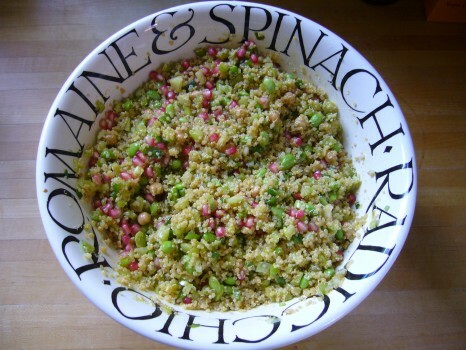 Mix it all together with the dressing (see recipe below) for a pretty, festive quinoa salad. Eat copious amounts! Taste and adjust as needed. 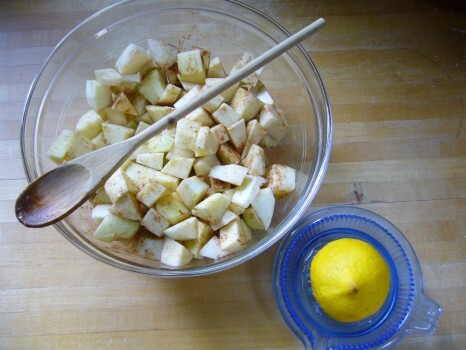 I usually play around with the amounts of tamari, salt and celery salt because I don’t want it to be too salty. Check it out! 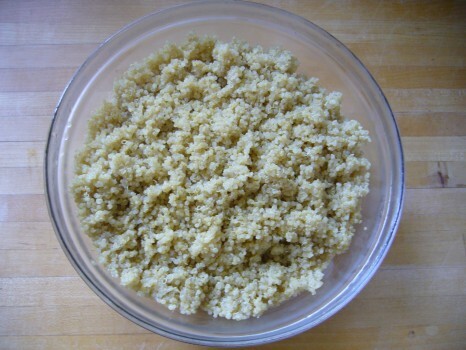 Quinoa is very versatile; it can be the basis for either savoury or sweet dishes. For some really creative quinoa recipes, from appetizers to desserts, check out the Queen of Quinoa. 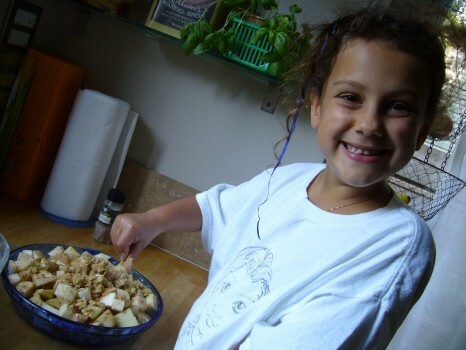 Posted in Blogs we ❤, Happiness is..., Recipes we ❤, Tummy love. 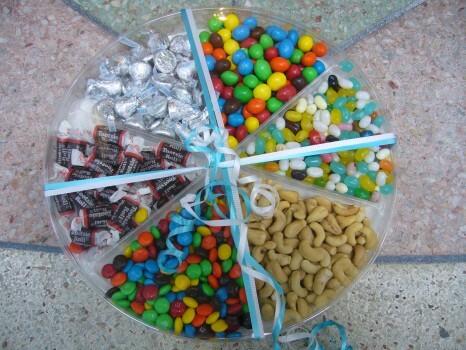 because I dare you to eat just one piece. version of her classic kugel. 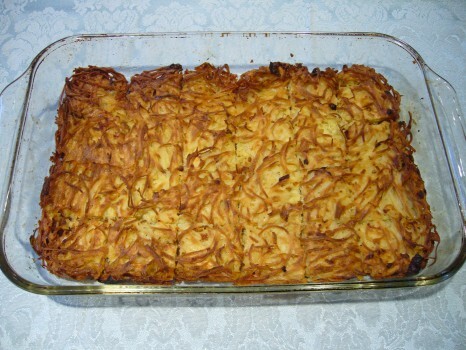 Just in time for the Jewish holidays, the queen of kugel is sharing it with us here. 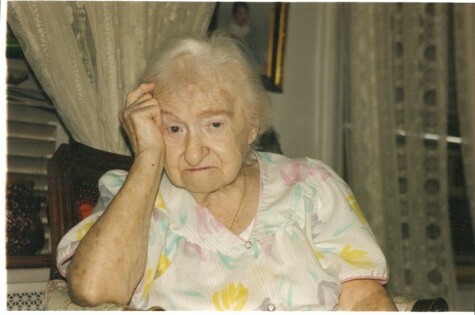 My great great aunt, the late Bessie Segal, in her East Village apartment, late 1990s. I named this dessert after her. 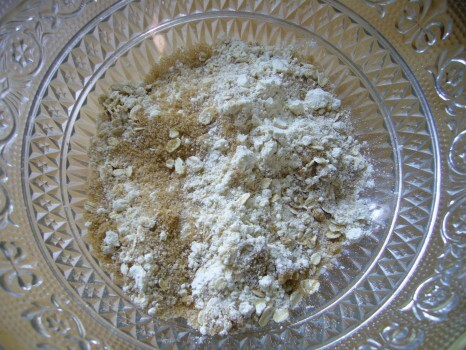 Combine “wet” ingredients in a bowl. 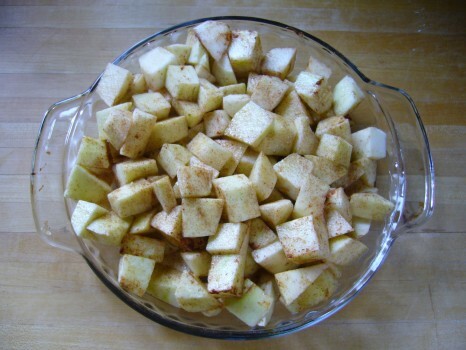 Put apple-cinnamon mixture in an oven-proof dish. 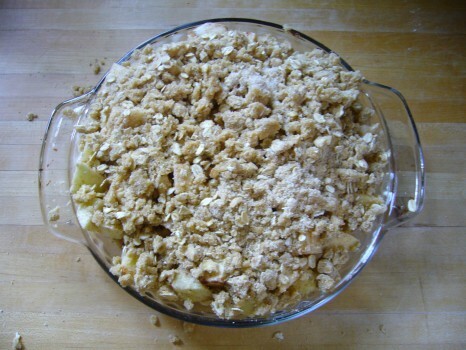 Sprinkle crumble mixture on top of apples. It’s good to have a helper. Posted in Happiness is..., Lily's corner, Recipes we ❤, Tummy love. Lasagna made with fresh gluten-free lasagna sheets! Rob declared this the best gluten-free lasagna we’ve had yet. The girls licked their plates clean. I had seconds. 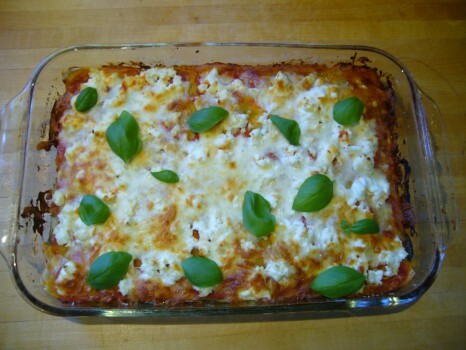 It was the usual recipe, so what made this lasagna different from all other lasagnas I’ve made? I took the noodles out of the package and simply started layering. No muss, no fuss. No starchy, slippery, wet noodles falling apart or sticking together. If you’ve ever boiled gluten-free lasagna noodles, you know what I’m talking about. And not only was it easier and more time effective to make lasagna with fresh pasta, it tasted so much better. Once you go fresh, you never go back! authentic pasta and holds together way better than its rice-based competitors. Located on Ossington north of Queen West, Hollywood Foods sells its gluten-free products under the brand Antipastos Kitchen. If you can’t make it there, in October you’ll be able to find their cut pasta, ravioli and gnocchi—along with several frozen gluten-free entrees—at supermarket and specialty stores throughout the GTA. Entrees will include meat and vegetarian lasagna, manicotti, meat and veg cabbage rolls, eggplant Parmigiana (can’t wait for that!) and a variety of raviolis and gnocchis. Posted in GFG exhibitor!, GFG updates, Happiness is..., Products we ❤, Recipes we ❤, Stores we ❤, Tummy love.